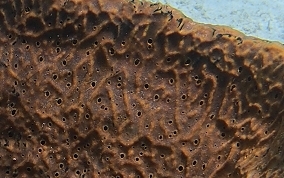 The inside is smoother and has many round open excurrent holes, while the exterior of the sponge has a network of raised ridges. 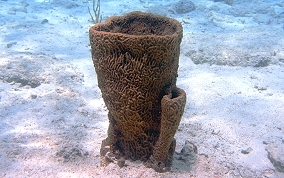 The color is a cinnamon brownish yellowish green and varies those colors from sponge to sponge. 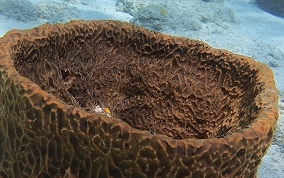 The first specimen was found in approximately 12 feet of water and was about 2-2.5 feet tall and a bit over a foot in diameter. The second was in about 7 feet of water.